"Are you thinking of opening your own online school? I decided to do just that as I have sitting, languishing on my PC about 70 PPTs all with handouts and additional materials which would be really useful to new and serving teachers. 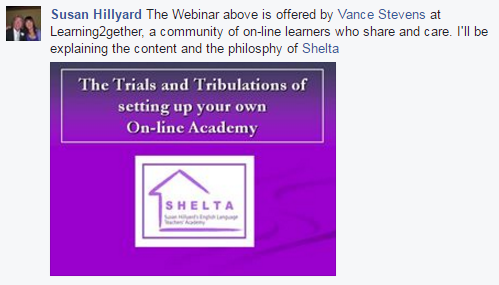 So I set about taking a course with Nellie Deutsch where I learned to design, build and open my first 6 week online course in my Academy SHELTA. In this presentation I will discuss how exciting and how difficult it was for me to get my head around the technology and how my first two courses panned out leaving me thrilled and determined to open a new theme as soon as possible." This is Vance's first attempt at streaming Bb Collaborate through YouTube/Live. If the experiment works you should be able to watch the BbC event here, and play the recording afterwards.